For Dr. Allen Rutberg, it wasn’t a question of what animals do, but why animals do what they do that led him down a path that eventually landed him in the field of animals and public policy. Growing up, Dr. Rutberg was intrigued by animals as well as ideas about the roots of human and animal behavior and how they interact with human culture, beliefs, and values. An early reader of books by Jane Goodall, Desmond Morris, and others who explored animal and human behavior, Dr. Rutberg obtained a degree in biological anthropology, and later a PhD in zoology. Initially interested in primate behavior, he eventually chose bison and then wild horses as the subjects of his research on social organization and its influence on reproduction. While Dr. Rutberg was studying the dispersal behavior of foals in the wild horse population of Assateague Island in Maryland, the population of wild horses was growing exponentially. To control this growth, the National Park Service invited two investigators, Dr. John Turner, Jr., and the late Dr. Jay Kirkpatrick, to adapt contraceptive methods they had developed out West to stop horse reproduction on Assateague. Foreseeing a dim future for his research on foal behavior, Dr. Rutberg joined the contraception team, beginning what turned out to be a 30-year research partnership. When, in 1990, The Humane Society of the United States (HSUS) was looking to hire a scientist-advocate who had experience with Yellowstone bison and wild horses, Dr. Rutberg was uniquely suited to the position. His responsibility was to help communities find humane solutions to conflicts with deer while advancing research in deer contraception. 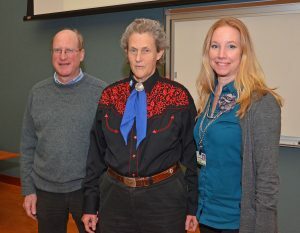 Dr. Rutberg (left) and the Center for Animals and Public Policy with the Office of Continuing Eduction often bring in guest speakers, including Temple Grandin (center), as part of the curriculum for MAPP students. 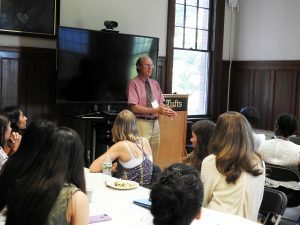 Still pursuing this research today, Dr. Rutberg’s experience with the science and politics of wildlife contraception lies at the core of what he shares with students at Cummings School’s Center for Animals and Public Policy (CAPP). His relationship with CAPP began early; while still working at HSUS in 1996, he fondly recalls mentoring two students in the very first class of the master’s program in Animals and Public Policy (MAPP). Through his coursework on quantitative methods, introduction to animal and wildlife policy, and communicating policy positions, he grounds his students in the reality that people with different experiences and perspectives line up facts in different ways. 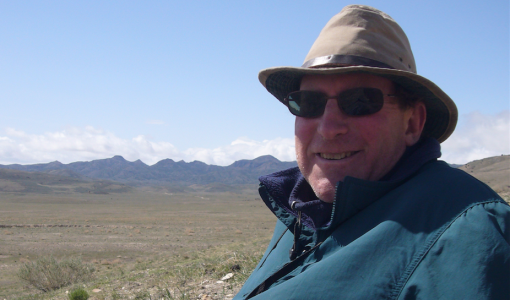 He teaches his students scientific research methodologies and how the research fits into policy debate, drawing examples from his experience with the political issues in urban wildlife conflicts, endangered species protection, and wild horse management. 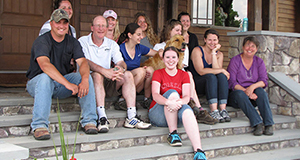 Dr. Rutberg strives to provide students with the tools to be constructive and positive advocates for improved human-animal relationships. His goal in mentoring students is to give them the tools to be constructive and positive advocates for improved human-animal relationships. “There’s a back and forth process that encourages students to think critically, ultimately arriving at a much better research product,” he says. “And they push me, a lot.” He takes pride when his students succeed, enhance their careers and move on to positions where they can make a difference for animals. Former student Kali Pereira, now working at HSUS, has joined him to advance research and use of deer contraception. “The level of dedication Allen provides to his students is abundant. He engaged my mind and fostered deeper critical thinking, prompting me to think inside and outside the box. His passion to develop humane solutions for human-animal conflicts helps to fuel my own contributions to those efforts,” says Kali. Dr. Rutberg has come a long way since he observed the bison in the hills and meadows of Yellowstone. As a leading researcher and expert on immunocontraceptive vaccines for wildlife, a week doesn’t go by that he doesn’t get a call from a community interested in using it. It’s just one more opportunity to involve students in the pursuit of practical solutions to the problems that arise when people and wildlife meet in the environments we share.